About five weeks ago I started a thread on nxtforum.org presenting the idea of having a global corporate design for Nxt. As wonderful as decentralized is, as confusing can it be for Average Joe to get anything out of, when surfing the different styles and designs that were Nxt’s face. I wasn’t the first one to propose it. But this time, the German based web agency Ideenfrische would make it for us. In fact, they wanted to. Deliver free proposals for a Nxt global corporate design, hear the wishes and complaints of a decentralized Nxt Community (! ), work hard on implementing it all, and don’t stop until it’s all finished. + more and more and more. The NXT Styleguide is an ongoing project and the guide + the amount of downloadable templates and files will be expanded. Nxt Wallet (Wesley’s client) is up next. Same goes for Nxters behind the scenes, Nxters with sites, clients, social media, Nxters with faces to show on conferences, video makers and whoever active in the community who want to flash the new corporate design. Let’s live up to it and take over. Let’s get things done. The next days and weeks our corporate design will begin to pop up. Nxt.org is in the works. NXT Newsletter will have new clothes. Nxtcommunity.org will soon blow your mind. Nxtforum.org – look in the .zip for a template file. Facebook, Google+, Twitter, Youtube, Vimeo, Pinterest, all our accounts should follow. And there are already business cards, brochures and a cool backdrop in print que for Amsterdam and China. 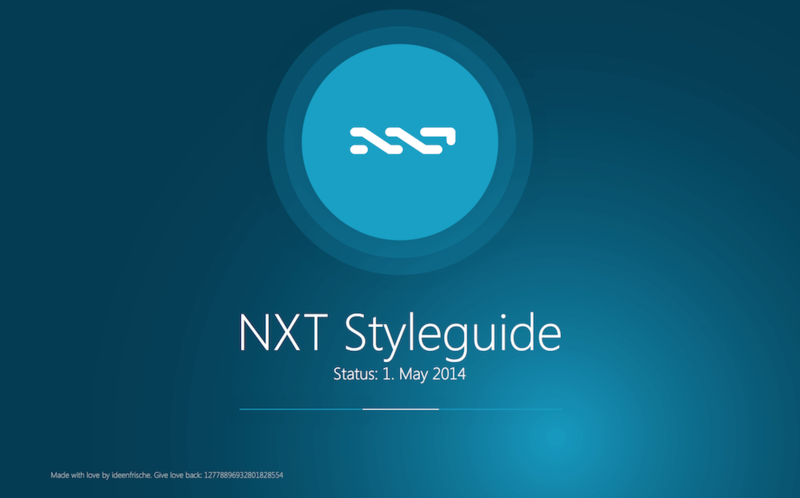 The NXT Styleguide and all files attached to it are open and free for all Nxters to use. Get it. Clones will be clones. Go! RT @Nxter_org: What style is NXT? The #Nxt corporate design styleguide is looking good!